King Herod's wife, Herodias, hated John the Baptist. The desert-dwelling prophet had dared to call her an adulteress for leaving her husband Philip to marry his evil but wealthier brother. Now the wicked queen determined to use her influence over Herod to get even with John. First, she persuaded him to have John imprisoned. Then she asked to have John executed, but Herod refused. He knew that John was a true prophet and feared political backlash from the people. Finally, Herodias developed a fool-proof scheme. 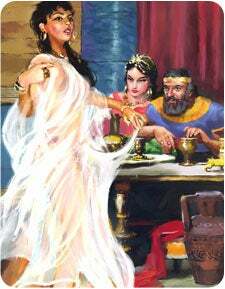 She threw a party for Herod's birthday and invited all his friends and the nobles from his realm, then she arranged for her beautiful daughter Salome to dance in a seductive, captivating style. 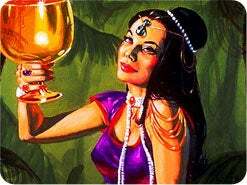 Herodias hoped that after Herod had a few glasses of wine, he would ask Salome what reward she wanted for her enchanting dance. Her sinister plan worked. After Salome's dance, Herod made a pompous oath: "Whatsoever thou shalt ask of me, I will give it thee, unto the half of my kingdom." Mark 6:23. As the inebriated guests were applauding the king's generosity, the girl stood ready with her reply. Then she shocked everyone by asking for the head of John the Baptist on a platter! Herod was stunned by the gruesome request, but all of his shocked friends were watching for his response. Afraid that he would appear weak if he refused, the proud king reluctantly gave the order. That very day the mighty prophet John was beheaded alone in prison. This was not the first time that a mother and daughter team used the government to persecute God's people. 1. What other mother and daughter team persecuted God's people in the Old Testament? 1 Kings 18:13. ________ slew the prophets of the Lord. 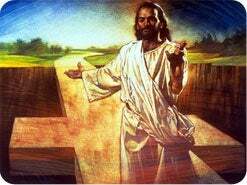 2 Kings 11:1 And when Athaliah ... saw that her son was dead, she arose and destroyed all the seed royal. NOTE: In the Old Testament, Jezebel and her daughter Athaliah were known for violently controlling the northern and southern kingdoms of Israel and Judah, and for forcing pagan worship on God's people. 2. What is the second angel's message in Revelation 14? Revelation 14:8. And there followed another angel, saying, _________ is fallen, is fallen, that great city, because she made all nations drink of the wine of the wrath of her fornication. NOTE: Revelation 14 contains an urgent three-point message that must reach the entire world before Jesus' second coming. In this lesson we will look at the second point of that message. God's indictment of Babylon is given because she has made all nations drunk with her intoxicating wine. This lesson will address some very straight, and perhaps disturbing, messages to both Catholic and Protestant believers. Remember that the second angel's message is from Jesus, the One we all love. Open your heart to His truth, for His only aim is to save and to bless you. 3. How does God symbolize Babylon in Revelation 17? Revelation 17:18. And the _______ which thou sawest is that great city, which reigneth over the kings of the earth. NOTE: In Bible prophecy, a woman symbolizes a church. A pure woman represents God's true church as described in Revelation 12. 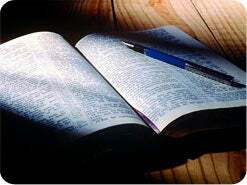 An unfaithful woman represents a church that has departed from the Scriptures. We can be certain who this fallen woman is, because Revelation 17:18 says she was ruling when Revelation was written. 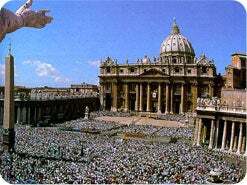 History tells us it was pagan Rome (Luke 2:1) that eventually turned over its authority, capital city, and power to papal Rome. 4. What other evidence from Revelation 17 proves that Babylon refers to papal Rome? A. She is guilty of __________ (verse 3). F. She sits upon "seven mountains" (verse 9). G. She ruled over the "kings of the earth" (verse 18). 1The Faith of Millions (Huntington, IN: Our Sunday Visitor, Inc., 1974), p. 401. 5. 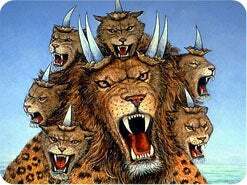 How do the beasts of Revelation 13 and 17 compare? Revelation 13:1. And I stood upon the sand of the sea, and saw a beast rise up out of the sea, having seven heads and ten __________, ... and upon his heads the name of blasphemy. Revelation 17:3 I saw a woman sit upon a scarlet coloured beast, full of names of blasphemy, having seven heads and ten __________. NOTE: The beast of Revelation 13:1-10 and the beast of Revelation 17 are obviously the same. Both symbolize this Roman power. Revelation 17 points out the church-state coalition, with the church (the fallen woman) riding and controlling the state (the beast). Revelation 13 also portrays two beasts involved in forcing others to worship. 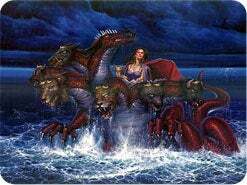 The first beast is the same power as the "mother of harlots" described in Revelation 17. This lesson will soon reveal the identity of the second beast. 6. 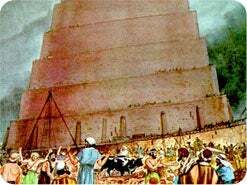 What is the meaning and origin of the word "Babylon"? Genesis 11:4, 6, 7, 9. Let us build us a city and a tower, whose top may reach unto heaven. ... And the Lord said, ... let us go down, and there _________ [confuse] their language, that they may not understand one another's speech. ... Therefore is the name of it called Babel; because the Lord did there __________ the language of all the earth. NOTE: The terms "Babel" and "Babylon" both mean confusion. The name originated at the Tower of Babel, built by defiant pagans after the Flood. They hoped to build it so high that no future floodwaters could cover it. But the Lord confused their languages, which created such chaos that the project was abandoned. 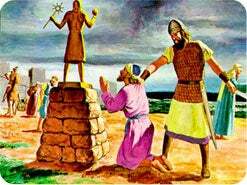 Babylon later arose to be an idolatrous world kingdom that persecuted God's people. In the book of Revelation, the term "Babylon" signifies a counterfeit religious kingdom that is an enemy of God's spiritual Israel. 7. How does God describe Babylon in urging His people to leave? Revelation 18:2-4. And he cried mightily with a strong voice, saying, Babylon the great is ________, is __________, and is become the habitation of devils, and the hold of every foul spirit. ... Come out of her, my people, that ye be not partakers of her sins, and that ye receive not of her plagues. NOTE: God says that Babylon has fallen and has become the home of devils and evil spirits. He warns that her sins are so offensive that Babylon must be destroyed. God's people must come out quickly, or else be destroyed with Babylon's plagues. 8. Jesus repeatedly indicts Babylon for making the world drunk with her wine. What is this wine? Revelation 17:4. Having a golden cup in her hand full of ___________. A. The Ten Commandments are not binding (see Lesson 6). B. Sunday sacredness (see Lesson 14). C. Secret rapture (see Lesson 3). D. Immortality of the soul (see Lesson 9). E. An eternal torment in hell (see Lesson 10). 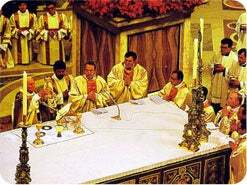 F. Confessing your sins to a priest (see Lesson 13). G. Counterfeit baptisms (see Lesson 11). H. A confusion of tongues (see Lesson 23). The sad truth is that once Babylon's messages are accepted, a person becomes spiritually drunk and virtually unable to understand what the Bible really says, because these false doctrines dull a person's ability to comprehend the truth. 9. What power will support the beast in the end time? Revelation 13:11, 12. I beheld ________ beast coming up out of the earth; and he had two horns like a lamb, and he spake as a dragon. And he exerciseth all the power of the first beast before him, and causeth the earth and them which dwell therein to worship the first beast, whose deadly wound was healed. A. The time it arose. God described this power as rising up about the same time the first beast goes into captivity and receives its deadly wound (Revelation 13:10, 11). The United States of America arose about the time the papacy's power was broken at the end of the 1,260 years, which was in 1798. America declared its independence in 1776, voted the Constitution in 1787, adopted the Bill of Rights in 1791, and was clearly recognized as a world power in 1798. B. It arose from the earth. As we've studied before, the waters from which most kingdoms (beasts) arose represent a densely populated area (Revelation 17:15). The earth represents the opposite. The United States fits this point perfectly because it was established on a sparsely populated continent. C. It had two horns like a lamb. In prophecy, a lamb represents Jesus and a horn represents power. 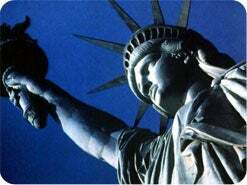 The two great horns represent Protestant principles upon which America was founded civil and religious liberty. The founding fathers fled from Europe to escape religious and political persecution. They established a society based on the principles of civil and religious freedom-"government without a king and religion without a Pope." 10. According to the prophecy, what drastic change will take place in America? Revelation 13:11. And he ______ as a dragon. NOTE: Speaking as a dragon means that the United States, under the influence of Satan, will reverse its original Protestant principles of the separation of church and state. It will pass religious laws forcing people to worship contrary to conscience or else be punished with economic sanctions (verses 16, 17) and finally death (verse 15). 11. What three powers will unite against God's people in the end time? Revelation 16:13. And I saw three unclean spirits like frogs come out of the mouth of the dragon, and out of the mouth of the beast, and out of the mouth of the false ________. 12. Will these diverse organizations ever effectively unite? Revelation 16:14. For they are the spirits of devils, working miracles, which go forth unto the _______ of the earth and of the whole world, to gather them to the battle of that great day of God Almighty. NOTE: Yes, God says they will unite. Notice that they are united in their work of spreading deception and building a confederacy against God's people. The "battle of that great day of God Almighty" is the same event as the dragon making war with the woman's offspring (Revelation 12:17). 13. What effective methods will this end-time coalition utilize? Revelation 16:14. For they are the spirits of devils, working _________. Revelation 13:13, 14 And he doeth great wonders, so that he maketh fire come down from heaven on the earth in the sight of men, And deceiveth them that dwell on the earth by the means of those __________ which he had power to do. NOTE: This end-time coalition will work mighty miracles by the spirits of devils, and almost the entire world will be convinced (Revelation 13:3) and deceived. Revelation 18:23 says, "By thy sorceries were all nations deceived." 14. What will prevent God's end-time people from being deceived? Isaiah 8:20. To the _____ and to the testimony: if they speak not according to this word, it is because there is no light in them. NOTE: God's people will need to test everything by the Bible. They will not be deceived, because they will test the miracles and teachings to determine whether they come from spirits of devils or from the Lord. 15. Today God is calling His people out of Babylon into the safety of His remnant church. He says that those who remain in Babylon will partake of her sins and receive her plagues. In Noah's day, only eight people entered the ark God had provided for their salvation. All others perished. Today He provides His remnant church as an ark of safety, and millions are entering. Jesus is inviting you to "Come thou and all thy house into the ark." Genesis 7:1. Will you say "Yes" to His invitation today? How Powerful Are the USA and Rome? 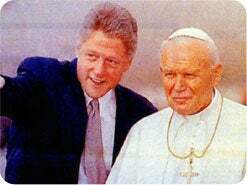 Revelation chapter 13 points out that in the end-time, the papacy and the United States will team up to influence the entire world to worship the beast. Are these entities powerful enough to accomplish this? 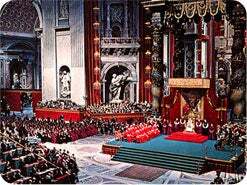 The papacy is by far the strongest religio-political power in the world. Nearly every leading country has an official ambassador or state representative at the Vatican. The pope is revered and welcomed by virtually all countries. 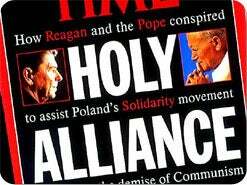 Former U.S.S.R. leader Mikhail Gorbachev said, "Everything which took place in Eastern Europe in recent years would have been impossible without the Pope's efforts and the enormous role, including the political role, which he played in the world arena. "1 The pope has made more than 50 world trips to achieve his goal of unifying the religious world under the papacy's leadership. "America's power will now determine all major global events. 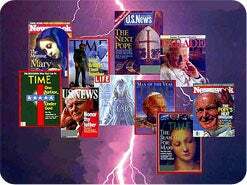 "3 Bible prophecy predicts with clarity that the United States of America and the papacy will join hands, and world events clearly show that the coalition is being formed. 1Toronto Star, March 9, 1992, p. A-1. 2"The UN Obsession," Time, May 9, 1994, p. 86. 3Jim Hoaglad, "Of Heroes ...," The Washington Post, August 21, 1991, p. A-23.